Butterfly Necklace is hanging caught mid-flight capturing their magical nature. Butterflies are one of the most magical and cherished creatures. Symbolic of transformation, spiritual rebirth, creativity, potential, joy, change, ascension and an ability to experience the wonder of life. Undoubtedly they have a magical presence as they gently dance in the air from flower to flower during a bright summers day. 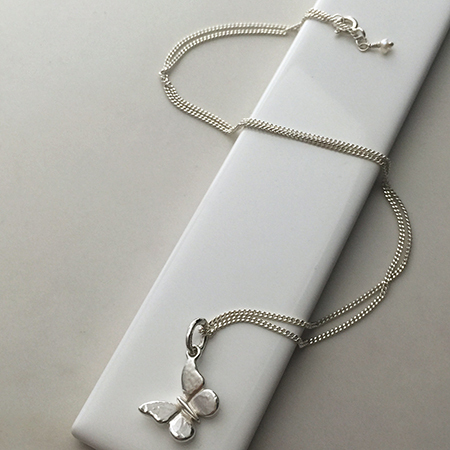 Give a gift of grace and beauty with this Butterfly Necklace. There is great cultural myth and lore that honour the butterfly as one of the most emblematic totem animals. Symbolic of transformation because of the butterfly’s impressive process of metamorphosis, the Butterfly is a powerful animal to call to when you need support in times of transition, whether it’s at work, a relationship, of for the self. The butterfly beckons us to keep our faith as we undergo transitions in our lives. The Butterfly Necklace is the ideal gift for anyone needing a reminder to keep the faith as they go through all-important life stages. Legends from Native American tribes thousands of years ago have various myths and folklore concerning the butterfly. They believe that the butterfly would carry wishes and prayers to the spirits. To be able to do this, one must first catch a butterfly without harming it, and then whisper secrets to the butterfly. The only one who will know the secrets that the butterfly carries beyond will be the spirit himself. According to the legend, a wish given to a butterfly shall always be granted, in exchange for setting the butterfly free once more. Butterfly Necklace, symbolic as the keeper of your best secrets. Such folklore behind the symbolism of the butterfly makes the Butterfly Necklace an ideal gift for your sister or best friend, the one you share everything with, one for you one for her. Spread the sentiments of luck, happiness and love brought by the magical butterfly. Butterfly Necklace by Bianca Jones Jewellery, a magical piece to add to your collection. It is now a very special and very loved part of our lives. A most heart-felt ‘thank you’ for your design skill and craftswomanship.